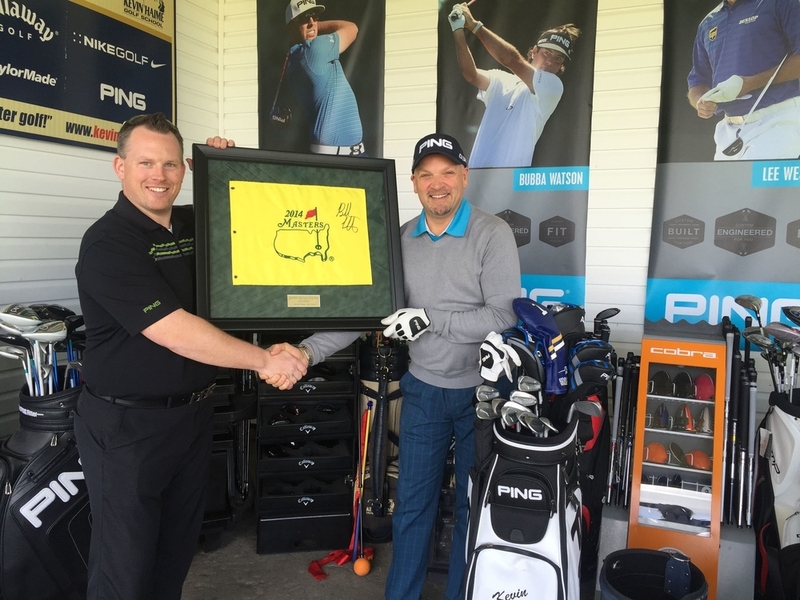 Andre Borys of PING Canada presents Kevin with his PING Club Fitter of the Year Award. Kevin awards one of his students the Junior City & District Championship trophy. Kevin broadcasting Tee It Up on TSN 1200 live from the Kevin Haime Junior Masters. Kevin coaches a fellow professional in our GEARS 3D Motion Capture Studio. 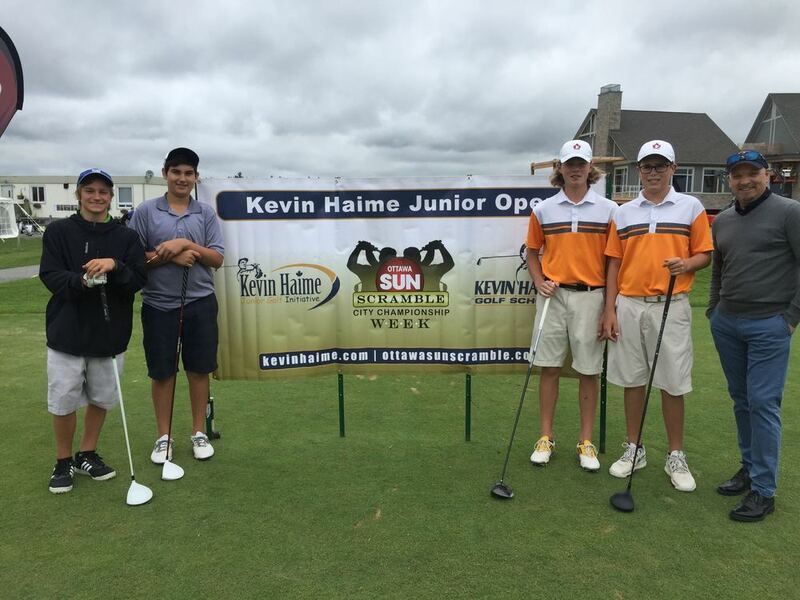 Kevin poses with juniors on the first tee of the Kevin Haime Junior Open. Kevin dissects some FlightScope launch data with a client. 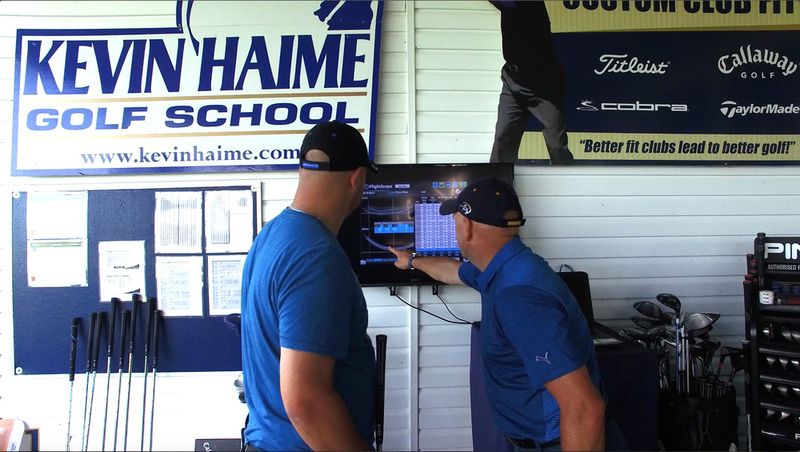 Kevin Haime is owner of the Kevin Haime Golf Centre, a world class practice centre in Eastern Ontario and the Kevin Haime Golf School, one of Canada's busiest and most successful golf schools. He has been teaching golf now for 28 years and prides himself on his ability to improve golfers of any skill level. Kevin works with professionals and amateurs. He is currently coaching a Junior National Champion, a Provincial Champion and an Ontario Provincial Team member among his many talented young players. Upon graduation, Kevin immediately turned professional. Just three years later at age 26 Kevin opened his first golf practice centre, the Double Deck Golf Centre and subsequently opened the Kevin Haime Golf School. Primarily recognized as a player, Kevin quickly earned a reputation as a leading teacher. He was named Canadian PGA Zone Teacher of the Year in 1997, 2000 and 2009. In 2000 his peers also voted him Canadian PGA National Teacher of the Year, the top award for golf instructors in the country. Kevin was also named a Top 10 Teacher in Canada in 2005 by the National Post, Canada's leading newspaper. He has been named Favorite Golf Teacher by the readers of Flagstick Golf Magazine every year the award has been voted on (2003-2017) and has been named a Top 50 Teacher in North America by Golf Range Magazine seven times (2004-2010). In 2008, 2011, 2015 and 2017 Kevin was named Canadian PGA Zone Junior Leader of the Year for his outstanding work with Junior Golfers through his Kevin Haime Junior Golf Initiative. In 1998 Kevin was nominated as Canadian PGA Zone President, a position he held for two years. As President Kevin helped spearhead the Clubs 4 Kids Junior Golf Charity Program and the Junior Challenge Tour. His extensive work with juniors led to his recognition in 2007 for Outstanding Contribution to the Game of Golf from the PGA of Canada. The Kevin Haime Junior Golf Initiative was founded in 2008 and has granted over 600 golf memberships to high-end private golf clubs. The program is designed to give kids with a passion for the game a chance to improve their skills and learn the many life lessons that golf provides. The Initiative has also awarded over 250 lesson grants with PGA of Canada Professionals and made generous contributions to The Brooke Henderson Foundation, The Ottawa Snowsuit Fund, The National Capital Outaouais Ski Team and The Serge Giroux Golf Dream Classic. Kevin has been happily married to wife Lisa for over twenty-five years and is father to two sons, Jake and Jackson.